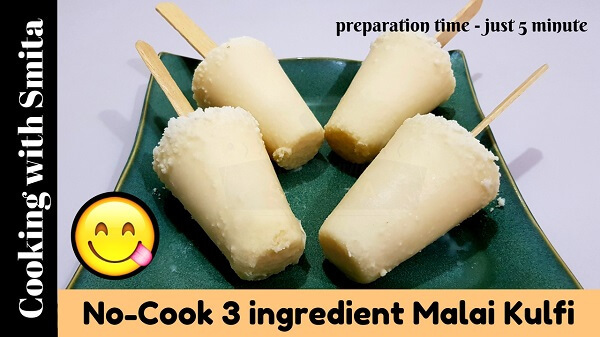 Easy, Instant No Cook Malai Kulfi recipe made with just 3 ingredients. Yes, you read it right, it’s made with Full Fat Milk, Condensed Milk and Mawa (Khoya). One of the Best and yummiest Malai Kulfi you can ever make at home in just 5 minutes. As it’s No-Cook Malai Kulfi, so it saves a lot of cooking time it takes to prepare traditional Malai Kulfi. I’ve used Homemade Condensed Milk and Homemade Mawa in this recipe making this Malai Kulfi a True Homemade No-Cook dessert. Follow this instruction to make this delicious & No Cook Malai Kulfi at home. I’ve used Homemade Condensed Milk and Homemade Mawa in this recipe. Boil full-fat milk once and let it cool down completely. Take a large bowl and add all the ingredients – Milk, Condensed Milk and Mawa. Mix using a whisk so that all the ingredients are incorporated well. That’s it – Malai Kulfi mixture is ready! So simple, isn’t it. Pour the mixture into Kulfi moulds and cover tightly with lid. Freeze Malai Kulfi for 6 – 8 hours or overnight. Before serving, warm the mould by moving it between your palms. Un-mould Malai Kulfi by inserting a wooden skewer stick in the centre of the kulfi and pull it out. Watch 3 Ingredient No Cook Malai Kulfi Recipe video in Hindi. 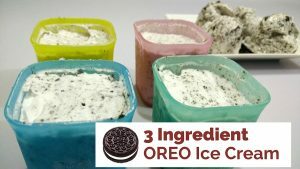 You might also like 3 Ingredient Oreo Ice Cream Recipe.